Ava is ready to set Manhattan abuzz with her wedding. At least until she realizes her fiancé wants marriage for the wrong reasons, and maybe she does, too. In a move as daring as a red satin dress, she does the unthinkable--she calls it off, taking on more debt than she can afford and returning to the single life. When Ava loses her job in fashion and her mom succumbs to cancer, she decides to revamp her life entirely, taking a vow of chastity and going for her dream of becoming a professional dancer. Change brings trial and error, and she's inching closer to financial ruin, but an undercover cop promises a new romance...and an unexpected friendship with the homeless guy beneath her stoop brightens her days. When her carefully balanced life teeters out of control, weddings aren't the only thing to make her cry. Ava has to figure out what life she really wants to live and what in the world love--unconditional love--means. 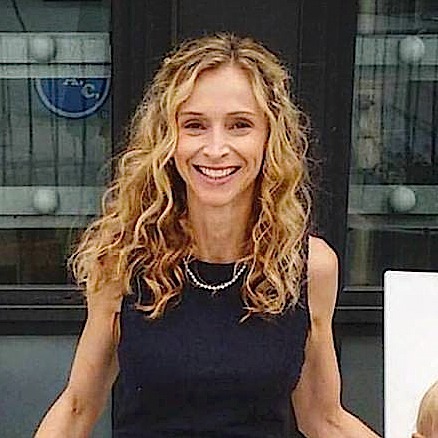 Sara Goff founded the global educational charity Lift the Lid, Inc. in 2010, which supports underprivileged schools and encourages young people to exercise their creative expression through writing. Formerly a New York City fashion designer/merchandiser, Sara left her seven-year career and resolved to make a difference in the world. Start reading I Always Cry at Weddings on your Kindle in under a minute. I Always Cry at Weddings could easily be a movie. Sara’s novel is set in NYC and begins with the heroine canceling her upcoming wedding. Since I visited NYC for the first time this past summer, I had lots of fun re-visiting it through the story. This is not your typical romance. In fact, for a good part of the book, I wondered if it was a romance. Not to say it wasn’t interesting reading. It was! Sara’s done a great job of showing Ava making tough choices. Ava is a woman who abandoned the values she’d been raised to live by, but who admirably doesn’t take the easy route out when she comes to her senses and realizes she’s not living the way she wants to live and is not really in love with the man she’s supposed to be marrying. Many women couldn’t walk away from a man with as much going for him as her fiancé for fear of never finding someone else, let alone never recovering financially. So from the outset, I admired Ava’s courage. There were times when I wanted to knock her up the side of the head for subsequent choices, as realistic as they were for a young woman struggling to find her way. The characters are fun and there are great twists. 5.0 out of 5 starsThought-provoking But Easy Read! This is an interesting, easy read where the main character Ava is a strong, but yet vulnerable woman. I couldn’t help but be relieved when she realized that she was wrong to live with her fiancé before marriage. And I was really cheering her on, as she realized that marriage wouldn’t be able to change a person, so she needed to step back and discover what love really was. But it was also a great story showing that one can’t always judge by appearances or by assumptions. Things aren’t always what they seem to be. An interesting line was: “Fear is unlimited and runs wild. Suffering has a beginning and an end.” And I loved this line: “we are most complete when we are giving something away.” Life, love, choices, change, inspired to realize one’s potential, unconditional love shown through example & acceptance, and faith are all great topics in this book, mixed in with some humor and some surprising twists! Thought-provoking But Easy Read! 5.0 out of 5 starsSurprised, I loved it! When I got Sara Goff’s book, I Always Cry at Weddings, in a promotion, I wasn’t sure I would like it, since the story takes place in New York City, and I am more of a country girl. I finally got around to reading it, and I’m so glad I did. This is a wonderful story, expertly woven. It even made me fall in love with New York City! Main character Ava is learning about true love, and realizes she and her fiancée Josh don’t have that. With her very posh and costly wedding only weeks away, she calls off the engagement and finds herself lost in a big city, trying to find love. I was right with Ava through the whole story, always hoping along with her that she would find what she’s looking for. With her impulsive and unwise choices, I sometimes wanted to give her a good talking-to. Would the handsome, mysterious NYC undercover cop bring her true love? Or maybe it would be in pursuing her dream, dancing. Possibly the kind, insightful homeless young man would help her know the love she seeks. I enjoyed Sarah’s writing, although there were a few scenes that I felt pushed the envelope in the Christian Fiction genre. This isn’t a ‘preachy’ Christian book, but Ava and other characters do have a relationship with God, and we see Him through her journey. I liked getting to know each character, and by the end I felt like I knew Ava, very well.I loved the ending, and I hope to read more by Sara Goff. Found this book while trying to choose a Kindle First selection. Interesting storyline and complex characters. Also clean, and intelligent dialogue. Ava makes serious life changes on the eve of her wedding and suffers the consequences. Even so, life goes on. So how does losing your job, being $80,000 in debt for a cancelled wedding, the homeless guy living under her stoop, her overbearing, yet well meaning almost mother in law, being evicted, a soup kitchen, dancing in a cabaret, her mother's death, a dog named Chickpea, and several really bad dates, translate into a HEA for Ava? I could never explain it to you, but Ms Goff does an excellent job! Sweet and poignant without being sappy, this story also is flavored with humor and redemption. 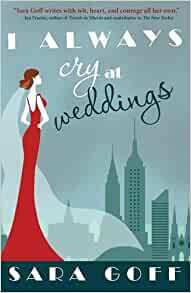 I actually had the pleasure of meeting the author on a recent trip to Stockholm and finally had a chance to read I Always Cry at Weddings. While I am an avid reader, I generally would not have picked up this book but am glad I did. The reason I am giving it 4 stars is for a few reasons: 1. It is rare to find a book where the girl protagonist who is going through a lot of major life changes at once (no spoilers here! ), be such a strong and independent thinker who follows her heart and truly "shuts out the outside noise" of other people's thoughts and opinions. It was very refreshing! 2. While some of the actual storyline might seem improbable at times, it IS NYC after all and I appreciated that the author did not tie every situation the protagonist finds herself in, into a neat little bow in the end. 3. It was fun to navigate with the protagonist on her musings and thoughts and she learned through her own mistakes and triumphs - she felt realistic in the sense that we all have dreams we want to pursue - and she actually goes for it - marching to her own beat throughout the story. I was so curious about how things were going to end up for her! 4. The character Chris was very intriguing - and the way he lived his life and how he influenced the protagonist was a delight to read. All in all, I enjoyed the book. It would be interesting to see this turn into a movie!